All, more amazing "behind the scenes" imagery from our pattern maker Bernie Perch. Thanks, Bernie! 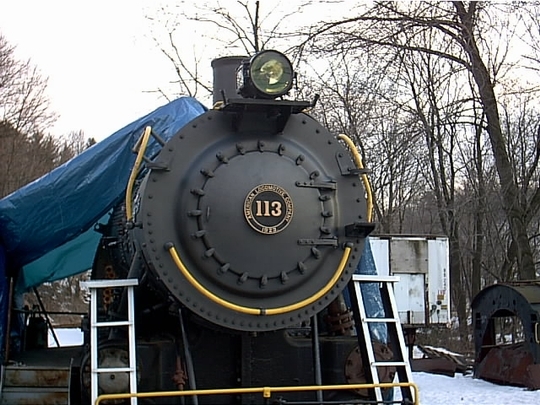 a standard gauge Alco 0-6-0 built in 1923 in Schenectady. The 113 is currently located in Minersville, PA.
Below are photos of an all-new reproduction Jersey Central RR three chime steptop whistle created by Bernie. The reason for 'building new' was that originals were scarce -- none could be found for purchase or donation. Then several years ago one became available for measurement. Without knowing if an original would ever become permanently available, or if he might end up having to "make one," Bernie took the time to record its exact dimensions. The 113 group spent several years inquiring through a multitude of sources and the internet, to no avail. Finally Robert Kimmel, Jr., president of Railway Restoration Project 113, asked Bernie to make the patterns for a brand new whistle. Active Brass in Telford, PA was chosen as the foundry. Casting such an object is a complicated endeavor, and it took considerable effort to explain how to set it up. The first two castings were OK and worked under air pressure, but the pattern and core box took quite a bit of tweaking to finally come up with the excellent casting seen in the photos. The following images show the plans, pattern and core box (which represent about 125 hours of work), the partially finished rough casting, and the finished bell atop a Western Locomotive supply (westernlocomotivesupply.com) bowl/valve assembly. Jeff Hosford of WLS prefected this assembly for his own projects and it was the exact design the group wanted, so there was no reason to duplicate his excellent efforts. The Project 113 group doesn't intend to actively market this whistle. A few will be cast for those close to Project 113 and friends. On December 28th, the whistle was tested on NH&I #40 and worked beautifully. It is being shown on this forum to show what can be done when exact parts are not available, and to honor the many others out there working toward similar goals. I'd love to hear what it sounds like. Looks perfect. Bernie, for someone who never had any experience in that area, you sure do excellent work. Amazing!! The pattern belongs in an art museum! And here's the new whistle in use on "test day" at the New Hope & Ivyland. Photos sent by Ron Muldowney -- thanks Ron! Yup, looks pretty nice up there! Mike Muldowney, Dave Haring, and NH&I No 40 sporting Bernie and Jeff's whistle, on December 28th, 2008. Click here to HEAR the new whistle during testing on the NH&I. Sounds absolutely beautiful, Bernie! And a big THANKS to Joe Fusco for the video. Perfect. #10 would sound nice with one of those. Like all railroad preservation projects, this took alot of time and effort on many people's parts and an extended thank you is on the RYPN forum. Thanx also to all who have commented. Now it's time to get back to number 11's drive wheel centers.